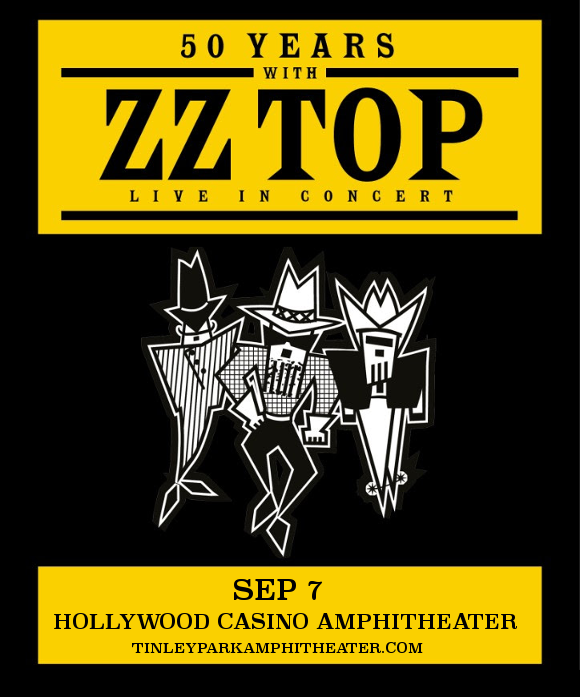 Classic rock fans, are you hyped for ZZ Top?? The legendary trio is hitting the Hollywood Casino Ampitheatre on Saturday 7th September 2019 in celebration of an astonishing 50 years together on the road – don’t miss it!! Tickets on sale now – get ‘em while they last!! Formed in 1969 and since 1970 consisting of band members Billy Gibbons, Frank Beard, and Dusty Hill. They released their first album, the blues-rock record “ZZ Top's First Album” in 1971. Their subsequent albums incorporated synthesisers and elements of punk rock, dance rock, and new wave, and the band became known for their humorous, tongue-in-cheek lyrical content. Their album “Eliminator”, released in 1983, is ZZ Top’s most successful to date. The singles "Gimme All Your Lovin'", "Got Me Under Pressure", "Sharp Dressed Man", "TV Dinners" and “Legs" all saw heavy radio rotation, with the music videos for some of the singles helping the band to gain a younger audience. Now, with sales of over 50 million albums around the world and countless sold-out tours, ZZ Top are one of the best-loved and most enduring and successful rock groups of the last five decades! "As genuine roots musicians, they have few peers,” stated Michael "Cub" Koda. "Gibbons is one of America's finest blues guitarists working in the arena rock idiom… while Hill and Beard provide the ultimate rhythm section support." Well, what are you waiting for?? Tickets are on sale now and expected to sell out fast – get yours NOW while you still have the chance!